I think that it makes no sense to test engine for front-engined car in Veyron mule, all modern tests are complex and there is no use to test them in this mule. All strictly IMO. 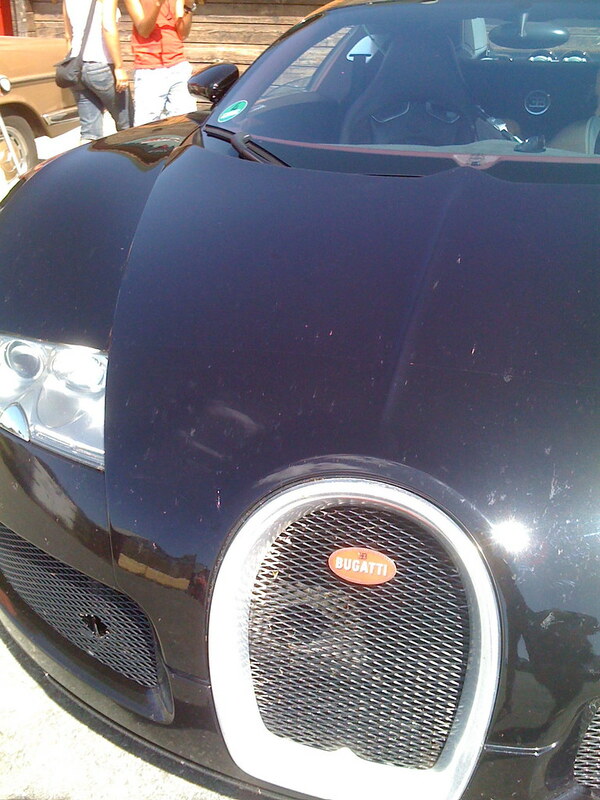 I think that it is the new version of current Veyron engine for new special version of Veyron or for Veyron successor. Yes, there were some mules spotted, some of them are with engine sensors, there were mules with camouflaged doors and fenders. All this lets to thoughts that there are some works with the engine and with the cooling system are going on. Here are few details I have heard about the final edition Veyron, which likely is exactly this so called Veyron GT, which many like to call Gran Prix, I would like to tell that all said are rumors only, we will know it for sure only when we will see the official press-release. Rumors suggest that this final edition of the Veyron will be about 150 kg lighter thanks to the CF use instead of aluminium for the body. The engine is rumored to be higher revving, about 7000 rpm instead of current 6000 rpm. The power is rumored to be about 1200 hp, possibly the engine will be flex-fuel capable. Top speed is rumored to be about 420 km/h. Active aerodynamics could be reworked as well to feed the engine with additional cooling. Expect the brakes to be slightly upgraded as well. The paint is rumored to be Royal Blue bare carbon fibre as on Sang Bleu combined with matte black carbon fibre, as the whole car's body is rumored to be made from carbo fibre.The car will feature absolutely unique interior and wheels as well. That is all I have heard, I can not say how trustworthy this information is, but I really hope it is true. A spyvideo of the future Veyron Grand Prix ! With a 1350 HP engine ! "325km/h but its a rumor.. Isn't official.. Probably place debut is Parisi 2010.."
BUGATTI News : 425km/h its a probably top speed but isn't official. And less kg.. Under 1650kg, Probably place debut Paris 2010..
Wow. Great. Superb. Astonishing news. I really hope that this will be the absolutely best hypercar ever made. I am waiting with passion for more official details. and carbon fiber instead of aluminium, and new seats. Engine probably will be good for about 1200 hp and maximum speed will be about 420 km/h. Some sources suggest that Bugatti chief of engineering Wolfgang Schreiber is working with his team on the flex-fuel direct injection version of the engine which will allow higher revvs, about 7500 rpm and about 1200 hp power output. Expect suspension, brakes, trasmission and aerodynamics to be slightly upgraded to handle the increased performance. Everything said is not my own information, I have read it from one source which I rate as rather credible and trustworthy. Any news about this awesome Veyron? I am more that sure that it will be the absolute kind of all automotive world if will be made. Mules are continue to run around and rumors are circulating more and more. Any news from credible sources? The name GP is not confirmed yet.. some would still like to name it GT.. I do not care so much about how it will be called, but I do care if it will ever come out as a production model. I simply can hardly wait to know more about it. I don't think the Grand Prix's engine output will be just of 1200hp, since the current engine already produces, in clear cold days, that amount of power. Bugatti engineers have always said the power output figures were conservative in comparo with the real numbers. That's why, if you look at the different press releases, the power is referred as 1001hp and 1001PS, whisc supposedly are calculated differently, but since the real power is superior whatever's the way you calculate it, they guarantee 1001 horse-power in any way. Hence, I guess the real power of the Grand Prix might be of around 1300-1400hp IMO. Recent rumors are suggesting that Bugatti will show us more powerful version of Veyron which will feature flex-fuel engine good for about 1200 hp and maximum speed will increase to 420 km/h, this car will be also lighter and will feature slightly reworked interior. No word on if it will feature Grand Prix name or if it will be unveiled at this Geneva auto show, but still if there are rumors that we can expect flex-fuel version of Veyron to be presented at Geneva auto show, this could be exactly this version. Anyone to confirm of to deny this information? I can simply hardly wait for this Veyron to appear as a production model. After the production run of the current Veyron, they will continue with a faster and more lightweight Veyron.